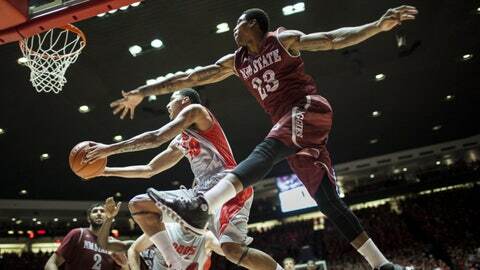 New Mexico's Kendall Williams unsuccessfully tries a reverse layup against the defense of New Mexico State's Daniel Mullings during the second half Tuesday. The Aggies won 67-61. "There’s got to be a player that does something special to win a game like this," Menzies said. "I knew he was going to go challenge," Menzies said. "I saw him running for it and timing it up. I was thinking just don’t foul him, just don’t foul him, just don’t foul him. And there was a man in between him, he actually came from behind his own teammate to make the block. So that makes it even more fantastic." "You’re down two with 40 seconds to go with a chance to tie and we didn’t tie it," he said. "And they finished the game." "We wanted to throw the first punch when the ball was tipped up," Menzies said. "We felt like they were a little wounded and we needed to do what we can." "We weren’t playing at a very good pace and we looked a little skittish," coach Neal said. "That might not be the right word but we looked a little skittish. We didn’t play with great Pace. We didn’t get into anything." "They got out on us 23-5 and once you do that, you’ve got an uphill battle," coach Neal said. "Obviously it’s a great win for our program," Menzies said. "This is not just another win. It’s a big win."